Google announced its Project Stream gaming platform today at GDC 2019, and it’s officially called Stadia. The firm is building a game platform for ‘everyone with access for everyone,’ called Stadia. Google said it will take “five seconds” to play a high-end game just by clicking a link on YouTube. During the keynote, Google noted there are barriers to playing some games, such as the need for high-end PC. Stadia is a platform which won’t take this into consideration, it seems, because it uses the cloud. It can be used on any platform, such as smartphones, tablets, PC, and televisions by logging into your Google account. You can then stream games to any of the these devices with the Chrome browser, without the need to download or install the game. You will also be able to start playing on one platform and then pick up later on another device. With YouTube, if you are watching a game trailer and see a “Play Now” notice at the end of it, it means you will be able to play it right away. “A fundamental part of our platform is that we’re screen agnostic,” Google VP Phil Harrison told Digital Foundry. “The thinking there is that for the last 40 years – all game development has been device-centric. As a developer I’m building to the constraints and scaling my creativity down to fit within the box I’m writing to. “We want to invert that model with Stadia; we want developers to scale up their ideas and be unbound by the constraints of any single device. 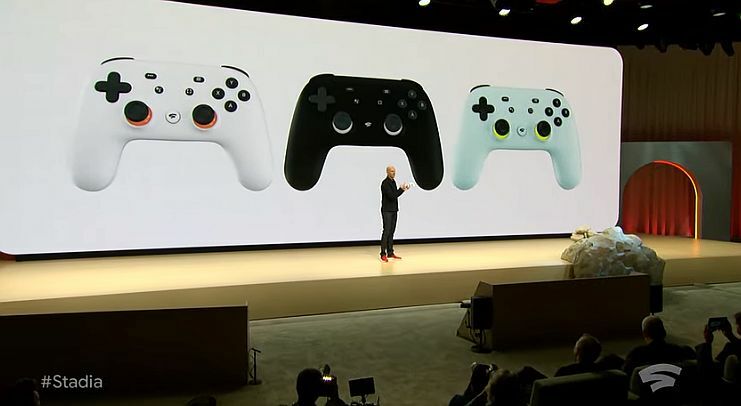 In short, there is no “barrier to entry,” as users can play games on any of these devices and use a keyboard and mouse, or the new Stadia controller. And according to Google, Stadia can stream supported games in 4K at 60fps, and will eventually support 8K at up to 120fps. It also supports HDR, and surround sound. The service is Linux-based and supported by AMD’s Vulkan graphics and compute API, and uses “10.7 GPU teraflops” which is considerably higher than current consoles from Microsoft and Sony. For example: PS4 Pro runs at 4.2 teraflops and the Xbox One X at 6.0 teraflops. Low latency and reliable connection is promised, which means those with a less than stellar internet service can play multiplayer games without issues. This is because Stadia does not rely on “local internet services”. It also supports cross-platform multiplayer and allows achievements and saves to be accessed, or transferred over. Google also said cheating or hacking won’t be an issue. Content creators on YouTube can also use a new feature called Crowd Play. At the press of a button, viewers will be able to entry a lobby to play with the streamers. There’s more YouTube integration where that came from: you’ll also be able to access game guides using Google Assistant. If you become stuck, there’s no need to quit out of the game, or go scouring the internet. Just by pressing a button on the Stadia controller, Google Assistant will detect which game you are playing, and connect you with a relevant video. Doom Eternal was announced for the streaming service, and id Software said it runs in 4K, 60fps and on a single, Stadia GPU. Along with id Software, Google is working with various studios and engine developers such as Unity and Epic Games’ Unreal Engine. The service will launch this year first in the US, Canada, UK and “most of” Europe.